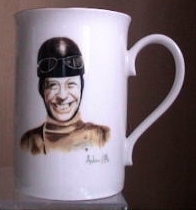 "GEORGE FORMBY - T.T. 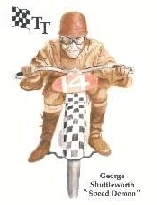 RACES"
In the George Formby film "No Limits", he plays a budding motorcycle racer called George Shuttleworth who desperately wants to win the Senior T.T. on the Isle of Man. 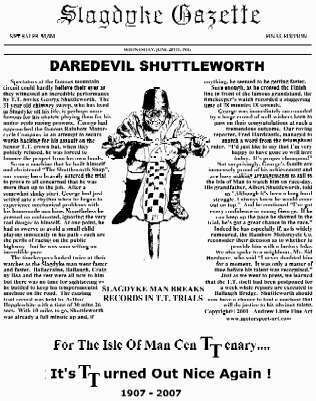 Shuttleworth leaves his hometown of "Slagdyke" and travels to Douglas with his home-made machine and, after several inevitable adventures, manages to set a record time in the preliminary trial. The film then returns briefly to Slagdyke where his mother is overjoyed to read on the front page of the "Slagdyke Gazette" about his amazing exploits. 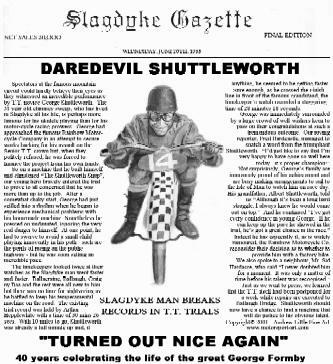 The headline reads "Daredevil Shuttleworth" and "Slagdyke Man Breaks Records In T.T. Trial" Sadly, there is no photograph of George on the front page and so I have attempted (65 years on!) to rectify that. 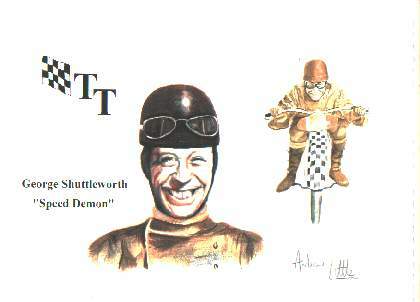 I have done some artwork of George astride his "Shuttleworth Snap" and written an imaginary report as it might have appeared on that very newspaper. I have laid it out to look like a newspaper front page and had the result printed in black and white on T-shirts. The printing is very clear and even the small print is as easy to read as a real newspaper. Design 2 - Centenary T.T. T-shirt! A new version I have created to celebrate the centenary of the T.T. race. This is the same as Design 1 but with an appropriate change to the lower headline and it uses a simple line drawing of George rather than the original artwork which was practically photographic. This simpler design reduces the cost of printing. Design 3 - Another Centenary T.T. T-shirt! Again an adaptation of a previous design to reflect the significance of the centenary. 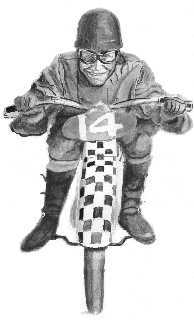 This is a black and white drawing of the artwork that appeared on my "Daredevil Shuttleworth" mugs. As it is a simple design it again reduces the cost of production. 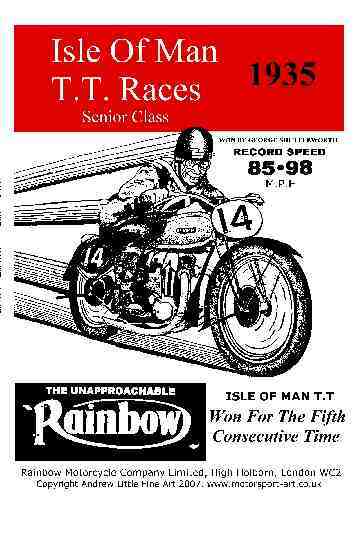 I have tried to imagine a poster or magazine advert that the Rainbow Motorcycle Company would have come up with to commemorate the fact that George Shuttleworth had won the Senior T.T. on one of their machines. This is what I came up with, based on my original artwork of George, and it is screen-printed in 2 colours on white T-shirts in the usual 3 sizes - Medium, Large and Extra Large. The price and ordering arrangements are as set out below for the other T-shirts. "Many thanks for the prompt (and trusting) service and the excellent product"
"Great quality printing and a nicely made, well fitting T-shirt"
"Many thanks for the George Formby T-shirts.........the quality and design is superb"
The T-shirts are white and made of good quality cotton and available in Medium, Large, and Extra Large. Designs 1 and 4 cost	£11-95 (to reflect the more complicated printing process). If you would like one just contact me and I will send you one (DETAILS BELOW). If you are happy with it, send me a cheque made payable, please, to Andrew Little Fine Art. A3 size prints - 12 " x 16.5 " (300mm x 420 mm) approx. on 280 gsm weight paper. Digitally printed using Lithograph quality inks. As you can see one is the Design 1 T shirt image printed on paper. There is also a print available of the colour version of the artwork that forms the illustration of the Slagdyke Gazette but without the newspaper text background. 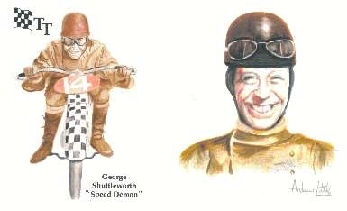 The third print is a montage of the portrait and the bike artwork. All prints individually signed by the artist. The prints cost £9.95 each including UK post and packaging. If you would like one just contact me and I will send you one (DETAILS BELOW). If you are happy with it, send me a cheque made payable, please, to Andrew Little Fine Art. 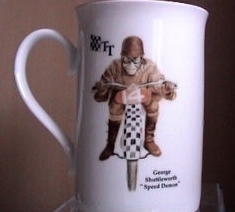 Fine bone china mugs that I have had produced in the heart of the Potteries with colour illustrations of Daredevil Shuttleworth as below. The mugs cost £7 each including UK post and packing. If you would like one just contact me and I will send you one (DETAILS BELOW). If you are happy with it, send me a cheque made payable, please, to Andrew Little Fine Art.